Okie now, there’s another piece of Transformers collection which bears an unique facial characteristic as Wreck-Gar earlier. 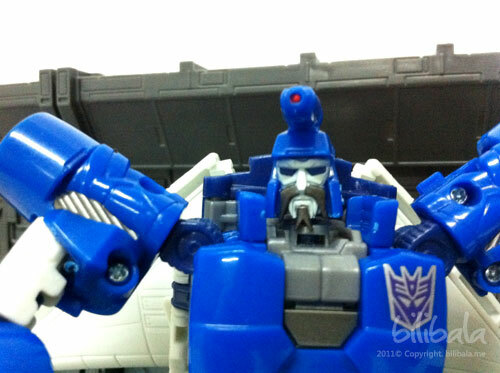 Yes, is another mustached Transformers toy that i have and this time he is a Decepticon known by the name of Scourge! 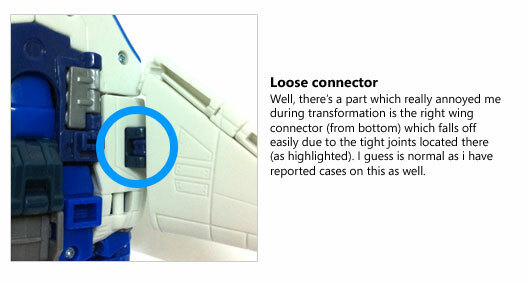 For those who are familiar with G1 Transformers they will definitely know who Scourge is. 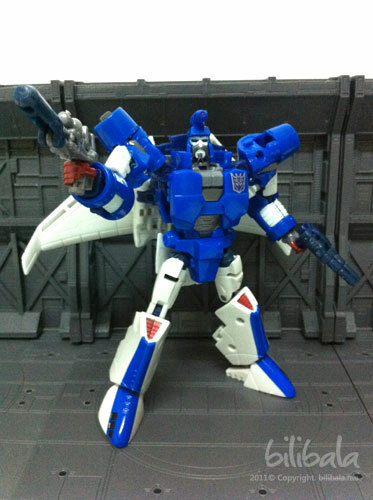 After rummaging over the internet and i found out that Scourge actually was created from the remaining of Thundercracker by Unicron. Quite interesting to know that. Anyhow, if you feel like reading more about this hammerhead-mustached villain, you can catch the full story here. 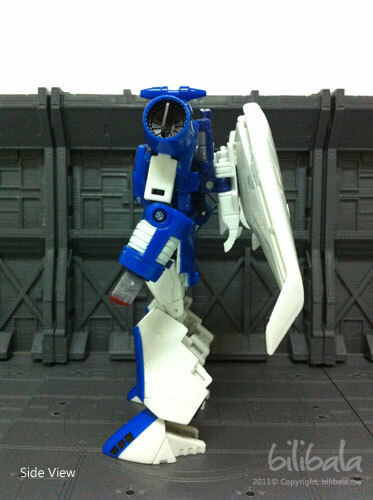 Now this is quite an interesting piece as it has quite a resemblance over G1 character, especially the overall headpiece and the body shape. 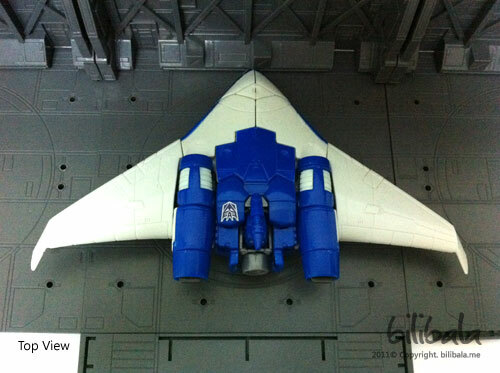 Apart from having the new alternate mode being a bomber-like plane, it does really look like G1 Scourge in robot form. 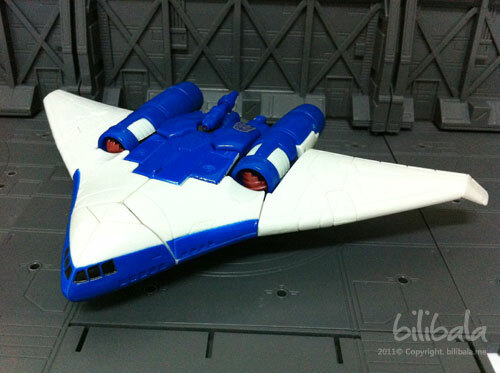 The alternate mode for Scourge is designed based on a new concept plane known as Boeing X-48 instead of a Cybertronic Hovercraft as in original G1 . 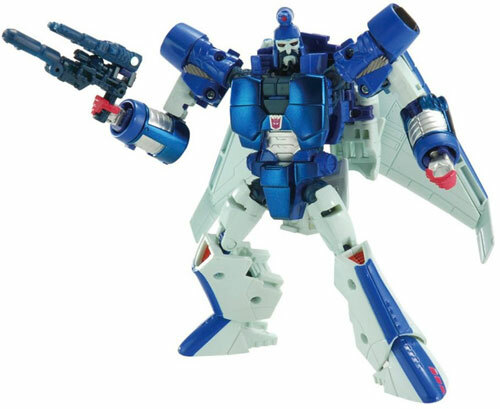 Upon digging up the info from wiki, the plane does look similiar and they really did blend it well with the new Scourge. The overall color scheme gives me the impression of blue sky and clouds with white color being the dominant. Okay. The plane is not floating here. This is because the plane has 3 landing gears located at the bottom of the plane to support the it while resting on a flat surface. 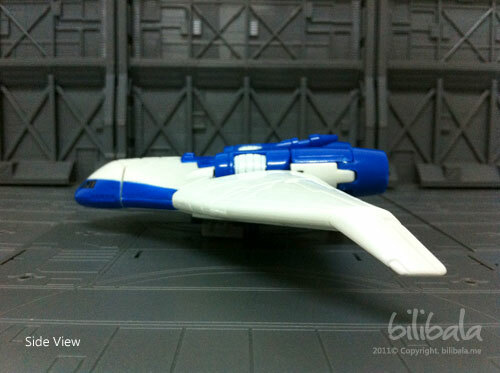 Will touch more on the details of the landing gear in the gimmick section below. The front turbine is actually being colored in a copper red color which is actually the hands of Scourge. 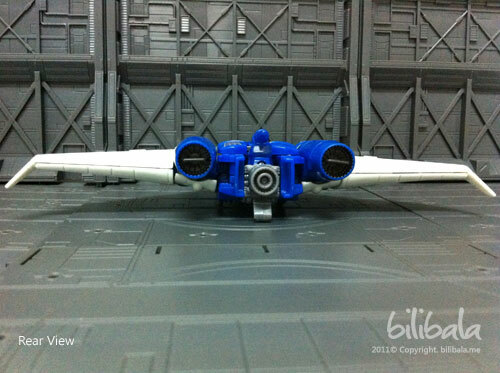 The rear of the plane has 3 turbines and 1 being the afterburner. Here’s a clearer view of the triangle shaped plane from the top angle. Scourge in robot mode does have a quite squarish design in my opinion. 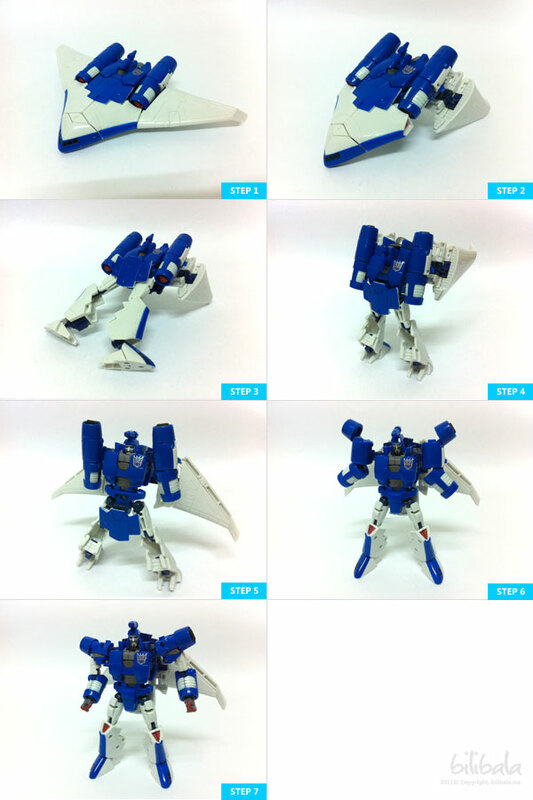 The overall articulations for Scourge is quite standard and nothing special on that. A point to note here is that there are some parts which are being colored in red copper as you can notice as below. 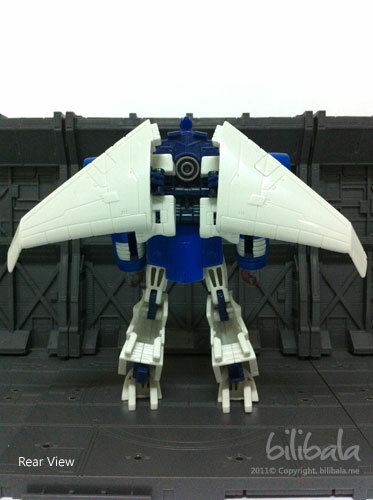 I like the wing at the back of the robot. 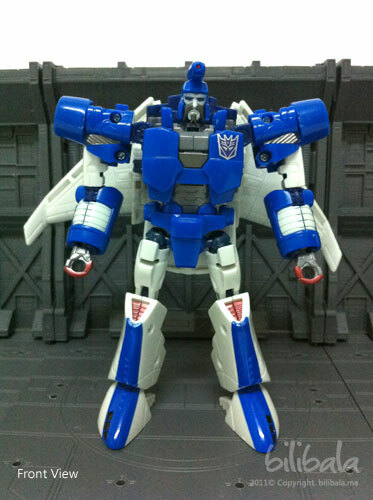 It makes it look like Scourge is actually wearing a jetpack. 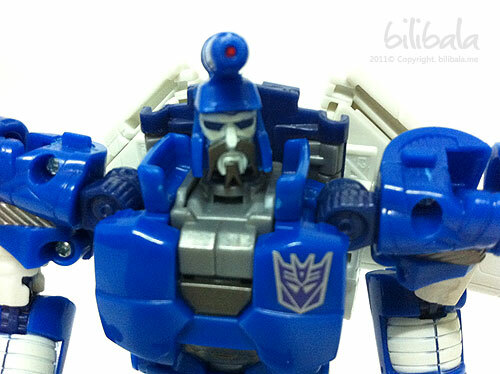 Here’s a close up on the Scourge for his head piece. Notice the mustache and the hammer-like structure on the head. A pose with 2 blasters in his hand! The transformation is quite intermediate. Not much complications. 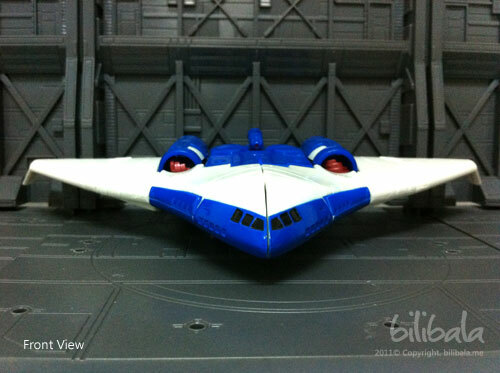 You can notice that the metallic coloring only applies to the turbines and the whole upper body for the robot mode. The white color does seem to have the same materials and instead of copper red in Hasbro, they painted it red which i particular chose Hasbro over this. 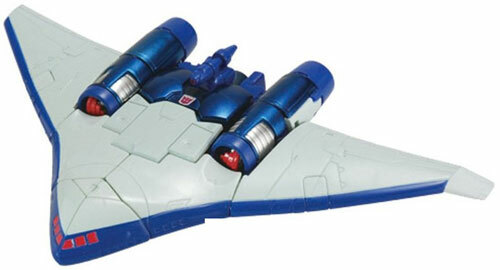 The cockpit windows of the alternate mode also is being painted red (as compared to Hasbro in black). Anyhow, the metallic touch of the United version does really add in more realistic details. Me personally still like my Hasbro version as the red color in the United version does really spoil the overall. Well, my personal rating for this collection will be: 8.5/10. Wait! That’s not all yet…. There’s still an eye candy for you here. 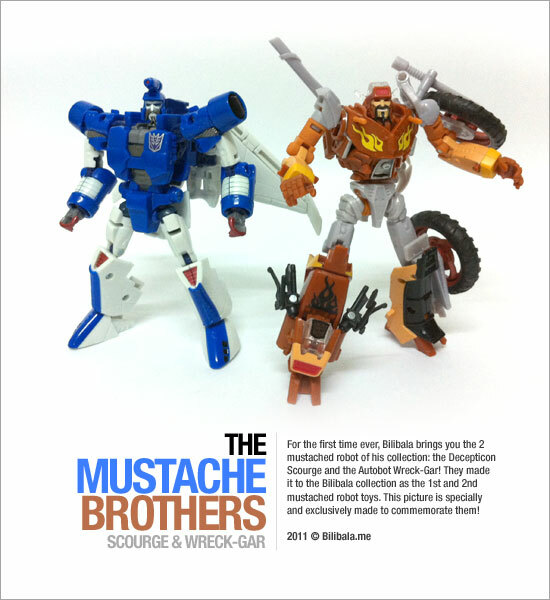 I took the time of doing a “commemorate” for Scourge and Wreck-Gar as they made it to the Bilibala record for being the 1st pair of robot to have mustache! It’s pure entertainment and purely personal opinion on the mustache thinggy and really no offence to those who is a Scourge/Wreck-Gar fan ya. I just feel that it is quite unique for a robot to have mustache. Wonder how they looks like when they are drinking milk (yea.. IF robot drinks milk that is). Hehe.